The Hopkins-Nanjing campus includes the 100,000-square-foot Samuel Pollard Building (at right in photo), which will be dedicated next week. The creation of the Hopkins-Nanjing Center took a giant leap of faith. A graduate program in international studies jointly run by two universities, even two such prestigious ones as Johns Hopkins and Nanjing University, was certainly not assured of success in the early 1980s. United States and China relations were not what they are today, and China had only just opened its doors to the outside world. Very few people in China spoke English, and the country's culture presented more mystery than fact to Americans. Likewise, citizens of China knew little about the United States. So, who would attend this new center, and would it even survive the decade? some questioned. Survive and thrive it did, and this month the center celebrates a milestone birthday and two decades of success. Former U.S. Secretary of State Henry A. Kissinger and former Chinese Foreign Minister Qian Qichen will give the keynote addresses at the 20th anniversary celebration of the Hopkins-Nanjing Center for Chinese and American Studies on Saturday, June 23, in Nanjing, China. Many senior Johns Hopkins officials, including President William R. Brody, who will deliver remarks, will also attend the celebration. The Hopkins-Nanjing Center is operated jointly by the Johns Hopkins University Paul H. Nitze School of Advanced International Studies and Nanjing University. The center has more than 1,600 alumni, many of whom have gone on to play significant roles in U.S.-China relations and become diplomats, professors, heads of industry and nongovernmental organizations, and journalists. The center's alumni cannot quite be credited with shaping modern China, but they have played a part. "Twenty years ago, it would have been unimaginable for the Johns Hopkins leadership to envision the China that we will be visiting in June," said SAIS Dean Jessica P. Einhorn this month. "For Nanjing University and ourselves, this is a celebration rich with meaning and excitement." At the anniversary celebration and reunion, the two universities will present Kissinger and Qian with the Hopkins-Nanjing Center Award for Outstanding Contributions to Cultural Understanding Between the United States of America and the People's Republic of China. Committed to continuing lively bilateral discourse, the center established the award to honor individuals who have positively influenced Sino-American relations. Kissinger is widely credited with opening diplomatic relations between the United States and China during his secret trip to Beijing in 1971, paving the way for President Richard Nixon's official visit the following year. Qian has been involved with the Ministry of Foreign Affairs of the People's Republic of China for the past 30 years. He made significant contributions to developing China's relationships with foreign countries, particularly the former Soviet Union and the United States, over the course of his long diplomatic service. Former JHU President Steven Muller first envisioned the center back in 1977. He wanted to replicate somewhere in Asia the success of the SAIS Bologna Center — a full-time graduate school in Bologna, Italy, that was established in 1955. He viewed China as the ideal location as it was, in his words, "the country of the future" and a burgeoning world power with which the United States needed to foster positive relations. "We also felt that the new center should not be in the capital city, Beijing, or Shanghai but another major city with a prominent university that would be our partner," Muller said last week. "We saw that Nanjing [University] could be that for us." Muller's proposal did not gain initial traction, but two years later a breakthrough was made when a delegation of 12 Chinese university presidents visited the United States, among them Kuang Yaming, then president of Nanjing University. Kuang had heard of Chinese-born Hopkins physics Professor Chih-Yung Chien and wanted to meet him. Chien then arranged for the visiting presidents to make Johns Hopkins the first stop on their tour and, quite simply, out of that meeting a relationship was born. The two universities began serious discussion of a jointly run center in 1981. Muller and then SAIS Dean George Packard led the talks on JHU's behalf, and in late September of that year the two schools signed an agreement for the establishment of the Nanjing University- Johns Hopkins University Center for Chinese and American Studies. 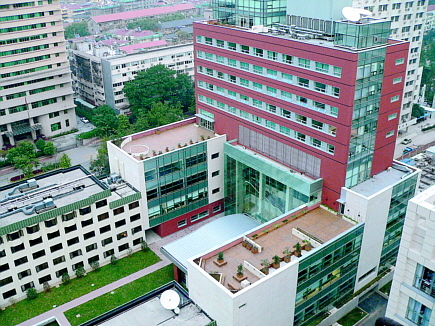 The Hopkins-Nanjing Center opened its doors in September 1986 and was one of the very first joint academic ventures between China and the United States. Twenty-four American students and 40 Chinese students enrolled in the first cohort of the certificate program. The center today is considered the most prestigious and largest facility in the world devoted exclusively to education for future leaders of the Sino-American relationship. In fall 2006, the center grew considerably with the opening of the Samuel Pollard Building, a state- of-the-art 11-story structure that added 100,000 square feet of new classroom, library, office, meeting and residential space to the campus, as well as a new auditorium and conference center. The center annually gives approximately 130 students from the United States, China and other countries the opportunity to live together and pursue graduate studies. American and other international students focus on contemporary China in courses taught by Chinese professors in Chinese, while Chinese students study the United States and the international system in English with U.S. and international professors. The center's library is the only uncensored, open stacks library in China and features more than 85,000 volumes, half in English and half in Chinese. The existence of such a library was unheard of in China in the 1980s and is still a rarity today. Muller said that the library was actually a potential deal breaker, as Johns Hopkins would not agree to the partnership without its creation. He said that he is very happy the Chinese officials acquiesced. "Now, after 20 years, the center is thriving, and I feel like a proud parent whose child has grown up and turned out well," said Muller, who plans to attend the ceremony with his wife, Jill McGovern. "I'm delighted to be able to participate in the celebration of the center's 20th anniversary and its recent expansion." Kathryn Mohrman, executive director of the Hopkins-Nanjing Center for Johns Hopkins, said that the draw for students continues to be the uniqueness of the center's offerings and culture. "The appeal for American citizens is the ability to understand how the Chinese think about such issues as U.S.-China relations and Asian economics from Chinese professors who can offer a different perspective than their American counterparts," she said. "Also, quite frankly, they feel their language ability will go up considerably in such an immersive setting, which it will. The benefit to the Chinese students is they get to understand the American perspective and significantly improve their English language skills without having to leave China." The school currently offers a one-year graduate certificate and, since fall 2006, a two- year master of arts degree in international studies, the first fully accredited joint degree of its kind between the United States and the People's Republic of China. Students take 14 courses and write a thesis during the two-year program. A minimum of 10 courses, plus the thesis and an oral defense, must be conducted in the student's target language. For Chinese students, the target language is English; for American and other international students, the target language is Mandarin Chinese. Mohrman said that the center has thrived despite some challenges, such as periods of financial insecurity, the NATO bombing of the Chinese Embassy in Belgrade, Yugoslavia, in 1999 and the outbreak of SARS in 2003, which forced the center to move its faculty and student population to the East-West Center in Honolulu for four months. A key to the center's success, she said, has been the pairing up of Chinese and American students, who live side by side in dorm rooms on the campus. Meghan Houlihan, a recent graduate of the center who now works in the center's Washington, D.C., office as alumni and program coordinator, said that while she certainly learned a tremendous amount in the classroom, the time spent with her roommate was immeasurably productive and rewarding. "When you're living with someone, you get to know what he or she is thinking and also how he or she thinks," she said. "I remember vividly having a conversation with my roommate one night while I was working on a paper. We stayed up until 1 in the morning talking about politics and our two countries. It was a really interesting talk about politics, marriage and many other subjects. We talked for hours using both languages, going back and forth from English to Chinese. I learned so much that night, it didn't even bother me I didn't get to finish that paper." Muller said that discussions and relationships like this one can prove fruitful in the coming decades. "It's important for the next generation of Chinese and American leaders to talk to each other and build understanding, and I think the Hopkins-Nanjing Center has contributed to this and will continue to do so," he said. Other celebration activities on Friday, June 22, and Saturday, June 23, include the graduation ceremony of the class of 2007; student-led tours and the dedication of the new Samuel Pollard Building; alumni dinners; a concert; panel discussions with center alumni and experts on U.S.-China relations; and a formal dinner and gala ball. For more information, go to www.sais-jhu.edu/Nanjing/center/anniversary.shtml.